Half of U.S. households report they wouldn’t have the emergency cash to cover a $2,000 financial crisis. This fact pushes millions of Americans into poverty every year, even striking those that have kept to a budget and been financially responsible for years. With the economy barely moving nine years after the financial crisis, it’s a problem affecting more people every year. 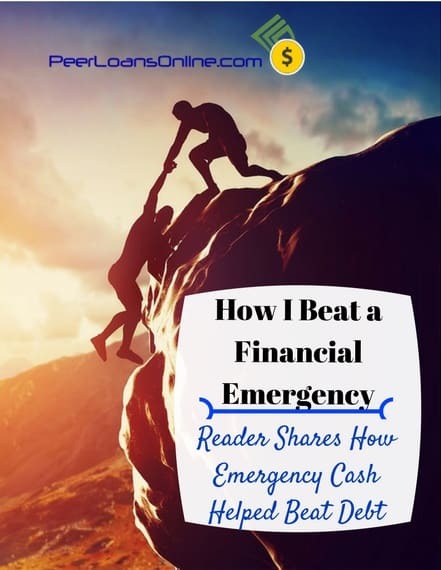 I got an email from one reader sharing his story about a financial emergency and how his family got emergency cash fast to get back on their feet. I reached out to the reader to get the whole story and asked him if I could post it here on the blog as a way to help others that might be caught in the same financial situation. In this three-part series, Mark will share how he thought his family was on its way to meeting financial goals until an emergency depleted their savings and forced them into debt. He also shares how he was able to use a consolidation loan to get back on his feet and get the emergency cash he needed fast. I hope you can use Mark’s story as a guide for how to deal with a financial emergency and how to keep from falling into the debt trap. Mark: We are a family of four in Wisconsin, plus one if you count our dog Sofie. I am a maintenance mechanic and my wife Angela was in customer service until our second son was born. After that, we decided it was cheaper for her to stay home and home-school the boys. My $42,000 annual salary isn’t much but we get by and were actually starting to get out ahead. We didn’t have any savings but had paid off all but $1,500 in credit card debt and owed less than $4,500 on our car loan. We rented an apartment so no mortgage and we thought we were doing pretty well. I started reading personal finance blogs on the internet about a year ago and knew that we should be putting away savings for emergency cash. It’s a good idea but we were still focusing on paying off debt and didn’t have anything left after making an extra $200 payment on the credit cards and car loan every month. It wasn’t a problem until one night in August. We had to rush our oldest son to the hospital for a peanut allergy. I had health insurance through work but the whole ordeal still cost us $3,000 on the co-pay and other expenses. You never think you’ll have a financial emergency or that you will just have to manage when it happens. That’s dangerous thinking because you don’t really know how bad you can ruin your finances or how fast when you can’t get emergency cash and things start to go downhill. To pay the medical bills, I got a cash advance and maxed out our credit card. The interest on the card was brutal and I ended up missing a payment on the car and the credit card. Missing two payments absolutely destroyed my credit score. The rate on the car loan and on credit jumped because of a default clause and things went from bad to worse. Now there was no way I was going to get an emergency loan from the bank or be able to get any more credit. Mark isn’t alone in his story. Research by the Center for Social Development found that almost half of American households have less than $2,000 to meet a financial emergency. That lack of emergency cash sets people up for financial ruin if an emergency hits…something that happens more often than you might think. 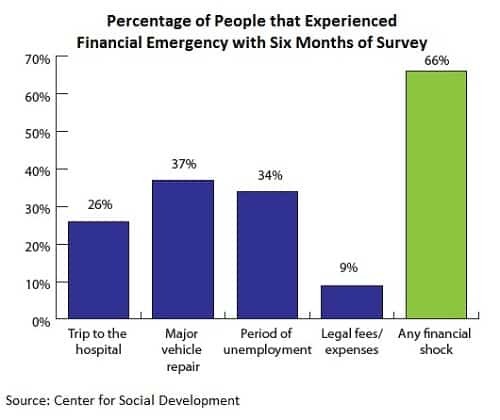 More than two in three respondents to the survey reported having a financial emergency within six months from medical expenses to unemployment and vehicle repair. The emergency forced 26% of those people into payday loans or car title loans at interest rates of 500% and higher annually. Possibly worse yet, one-in-four people that reported suffering a financial emergency had to skip medical treatments for lack of emergency cash. The debt was starting to pile up. We had just under $8,000 in debt from the car loan and credit card after paying off the medical expenses. The interest payments were so high that we ended up missing another payment on the car loan and they were threatening to repossess. I would warn everyone from using those buy-here-pay-here car lots. It may seem like a good way to buy a car but it’s just asking for financial trouble. We were trying to sell the car to get out from under the loan and maybe get a little money out of it. We found out the dealer had jacked up the price so much that we still owed more than it was worth even a year after paying for it. At the first sign of trouble after missing the two payments, the dealer wanted to repossess the car. I tried to raise money on GoFundMe but that just wasted time and made matters worse. Those websites are fine if you have friends and family that can loan you the money but don’t help people like me. None of my family is rich and were dealing with financial emergencies of their own. I knew that if I didn’t get some emergency cash fast, we would probably have to file bankruptcy because there wasn’t any way we were going to get out from under the debt. The interest payments and late fees on bills we were missing were just piling up and eating into any extra cash we had before. I read an article about peer to peer loans for bad credit and hoped it might be a solution. I knew I didn’t want to go to a payday loan store because I was afraid I wouldn’t be able to afford the fee they charge on the cash advance. I also didn’t want to try debt settlement because I heard that it can take years to work out a deal with creditors and is even worse on your credit score. My number one goal was to get my interest payments down to the point that I could at least cover minimum payments on the bills. I was hoping to be able to have some extra money each month to start an emergency fund so we didn’t go through this again. I applied to Lending Club first for a peer loan. I read that they have lower rates but I was afraid my bad credit was too low to get approved. I found out that you can apply for a loan without affecting your credit so it didn’t hurt to ask. Turns out, I was denied for the loan on Lending Club because of my credit score. My FICO was 590 and didn’t make the cutoff for loans. I next applied to PersonalLoans and was approved for $8,000 on a three-year loan at 21% and payments of $301 per month. The interest rate was more than I expected but still lower than what I was paying on my credit card and we wouldn’t have to worry about the car loan. I paid off the car and the credit card with the loan. By doing that, we were already saving $44 a month in interest (over $500 a year) and were paying one bill instead of two. We were also saving on fees and late payments because we were able to cover everything with my check. This is just the first of three articles where we’ll use Mark’s story as an example for financial emergencies and how to avoid the debt trap. In the next post, Mark will go into more detail about how he used the fast emergency cash to get out of the situation. We’ll share some tips for saving an emergency fund and what to do if you find yourself in the same situation.